Nootropics, by definition, are cognitive enhancing supplements that (claim to) improve concentration, enhance memory, and boost mental stamina. Ahhhh… you might be thinking, nodding your head with a conspiratorial grin, the old ginkgo biloba and cup of coffee trick. Move over grandpa—there’s a whole new school of brain-enhancing products, and they’re gaining market share in the supplement/wellness industry. The concept of smart drugs became mainstream in 2011 with the movie Limitless*. Eddie, played by Bradley Cooper, is a struggling writer who samples a nootropic called NZT-48. While he’s under its effects, he’s able to hyper-focus and quickly produce high-quality work—like, writing hundreds of pages of a novel in one sitting and teaching himself to become profitable in the stock market. I first heard about nootropics (real-life Limitless drugs) in 2014 when I was living in Seattle, home to big tech companies like Microsoft and Amazon, where people are constantly looking for ways to squeeze more brain juice out of their already high-functioning noggins. Often, this is done through innovative time management techniques (I write about some of them in Age of Agility) and biohacking (Seattle is home to the celebrity biohacker, Dave Asprey—you might know him as the Bulletproof coffee guy). Occasionally, biohacking crosses over to recreational drug use (what helped you cram for an exam in college, not surprisingly, helps you pull off all-nighters when a work project is about to hit a deadline). Nootropics fall somewhere between biohacking and recreational “what helped in college” drugs, and that’s one of the reasons they’re controversial (see #13 to learn the difference between a drug and a supplement). Four years later, they’re now making their appearance in Minneapolis. Meaning, if they’ve lasted this long and are moving towards the Midwest, they’re about to tip. Are they safe? What are the effects? Can I buy them over the counter? I’ll answer all these questions and more in my 14 lessons-learned below. I DO NOT endorse or promote any products, lifestyles, diets, etc. Besides, you shouldn’t start a new supplement without first doing your homework and talking to your primary care physician. You might be asking; how many are there? What do they do? Let’s start on my home turf with Dave Asprey, creator of Bulletproof Coffee. Two years ago, he wrote a blog post about his favorite nootropics, which include: Adrafinil, nicotine, amphetamines (remember... “what happened in college...”), forskolin & artichoke extract, L-theanine, Bacopa Monnieri, the Bulletproof product “unfair advantage,” KetoPrime, and NeuroMaster. I’m not a fan of any on his list and some are downright scary (no wonder there’s bad press about nootropics). Amphetamines? Do I even need to comment on this? Nicotine is a slippery slope into an unhealthy addiction, L-theanine gives a minor boost—that's why it's commonly used in energy drinks—but it's easy to take too much and become overstimulated, and the Unfair Advantage doesn’t have much of an effect on me, and this may be because I take CoQ10 already? Oh, and Adrafinil is a non-prescription variation of the narcolepsy medicine Modafinil. Sorry Dave, no dice. I’m going to write about a nootropic I’ve been taking that’s not on the list: noopept. Specifically, truBrain’s product that contains noopept: truBrain Boost. Noopept is a synthetic nootropic that has some compelling evidence supporting its cognitive boosting abilities. Examine.com has a thorough review of its history, studies, effects, and drawbacks; you can read all about it here. I’ve been taking it orally via the branded product truBrain, which was developed by researchers at UCLA (this is totally a market tactic to give it credibility, because right now, nootropics have NO CREDIBILITY because they are UNREGULATED). truBrain is a little 1-oz. shot pouch you rip the top off of and slurp down. If you have ever sucked down GU Energy Gels, it’s similar, but more liquid. In addition to the cognitive enhancer noopept, there is also 100mg of caffeine and some amino acids. If you are only looking for noopept, you can buy it in pill and powder form, which makes it feel more like a party drug and less like a supplement. If you browse the nootropic message board, there are people using other methods: nasal spray, letting it dissolve under their tongue, snorting it—I mean, practically everything but injecting it. But, it’s the internet, and when I was in high school, people snorted caffeine pills, too. In a roundabout way, I’m saying that taking it orally is recommended (I read the message boards and sifted through the 15-year-old gamers’ comments so you didn’t have to—you’re welcome). Specifically, my cardiologist. I was born with some heart defects and had open heart surgery when I was young. This has made me extra cautious when trying new supplements and lifestyles (i.e. diets, like the caveman diet and training for a marathon), even if the supplements have peer-reviewed studies backing their claims. I wanted to get the greenlight from him before experimenting. It was a go! According to his 30+ years in the medical field, he doesn’t think it will affect my heart. And, in general, I get the feeling that he doesn’t think supplements are very effective. That may be because he's well aware of the placebo effect, which brings me to point number three. I have to come clean about something. The placebo effect is real, and I often get sucked into new trends because I want them to work (and so do most people). I want there to be cognitive-enhancing pills that make me super smart and productive like Bradley Cooper in Limitless, so I may be biasing the results (See: confirmation bias). Keep this in mind as I tell you about my experimentation, because there’s a good chance that me wanting it to work is playing a role in my experience. It’s like the opposite of a hangover. I don’t struggle waking up in the morning and I’ve noticed that I am more attentive to my family members; instead of walking like a zombie to Atlas’s bedroom (our nearly one-year old) I’m excited, peppy, and ready for morning snuggles. This may be due to the observed anti-depressant qualities noopept has. And because of this, from a productivity standpoint, I’m skeptical if I only feel like I’m more productive because I feel happier. I liken it to the effects of someone drinking alcohol; the more alcohol someone consumes, the smarter they feel, when in reality, the alcohol is doing the exact opposite. Overall, I have noticed that I am more conscious of my time and I rarely stare off into space. I get sucked into my work and flow is more easily achieved. I’m probably more sensitive to caffeine than most (everyone’s brain and body chemistry is different). After the caffeine overload, I'm drinking more tea and less coffee, and I feel like I’m in a good place. Since I’m waiting on my next shipment of truBrain, I’m trying noopept powder and even though I’m consuming about 10 mg/day (12mg is in one truBrain pack) it feels like it’s hitting me harder than truBrain and I’m not a fan. One of my friends who has been using nootropics for more than four years cautioned me about dosing and suggested micro-dosing. Micro-dosing is when you use as little as you can to get the desired effect, while not going above what your body can handle. Basically, start small and stop as soon as you feel something. After all, the goal of nootropics is to give you more focus, concentration, and energy, not to make you tweak out like it’s a party drug. On the message boards, the people who don’t like noopept or have had adverse reactions took too high of a dose. I started with 5 mg 2x a day and I'm feeling overstimulated, so I'm reducing my dose to 2.5 mg 4x a day to see if it makes a difference. Shortly after taking truBrain or noopept (in powder form), I become hyper-focused. People who are not willing to stay on task or on topic become frustrating. As a result, I am short with them. If I had to explain myself more than twice, I was frustrated. If someone couldn’t keep up with me, I had to focus on not getting pissed off. (I don’t think I did, because my focus went from the topic of the conversation to acting calm and in control.) Another drawback is I am less patient (only in this two-hour window), so if something’s not “worth my time,” I simply walk away and find something that is worth my time. When I was working in the Seattle tech industry, I met some people who were very go-go-go. They were assholes. Productive, but assholes. I felt like I could have easily turned into one of them. This only lasts an hour or two before the effect dissipates into a more mellow focus. It wouldn’t be an issue if I didn’t have to work with other people—and maybe I should only use Noopept when I’m writing alone? The irritation could also be my body adjusting to the new chemical. This isn’t something I’m concerned about—yet— but it is something I am monitoring. Compared to the irritation I get from drinking an energy drink, noopept and truBrain is much more mellow. I’m not nearly as irritated as I get when my heart starts doing backflips in my chest and 90 minutes later I feel the sugar crash. On the flip side, it did build my confidence—but, it’s possible to become overconfident. Again, this falls back into the trap of a drunk person thinking each drink is adding points to their IQ where in reality the points are being taken away. Because I am moving so fast, the rest of my body can’t move with it. I have too many words to speak, my mouth can’t keep up. I have too many words to type, and my fingers can’t keep up. Getting the words out is my only priority, so I don't pay as much attention to what else is going on. The result: More focus, slightly less retention. Being a parent to a nearly one-year-old, working full time, writing, and having a side hustle, I try to get as much sleep as possible. I never have difficulties falling asleep—but I have read that people do (it might only be the people taking Adrafinil, because it’s A FREAKING NARCOLEPSY DRUG). I’ve also read that people have had strange and lucid dreams. I have strange and lucid dreams already, so I haven’t noticed anything different. I’m drinking more water than I regularly do. Which is odd, because I drink a lot of water as is. I don’t think it’s an issue—right now, at least—but it’s an interesting side effect I’m going to note. Since truBrain has 100mg of caffeine in it and I’m drinking Bulletproof coffee already, I might be overloading my system with caffeine (caffeine is a diuretic, so there’s a lot more turnover in my body). If you buy the pills, you can get 90 20mg capsules for about $20, so this comes out to about 22 cents/day (at one pill/day). Not bad. But, I don’t like the pills (it’s too party, party, party!). truBrain is more expensive. Depending on the plan, you can purchase a monthly supply for anywhere between $1.50 and $2.17 a day. It does add up—but so does your cup of coffee or energy drink in the morning. If you decide to make this part of a routine, make sure that you plan for it in your budget. On a Skype call with an old friend from college, I mentioned my experiment with nootropics. He listens to a lot of podcasts and told me Oh No Ross and Carrie said it was all a bunch of baloney. Basically, I was throwing my money away on snake oil. I gave it a listen. And. I wasn’t impressed. Ross and Carrie came in with their own confirmation bias that it wouldn’t work, so anything they tried already had two points knocked off. And then, they didn’t even try true nootropics. They just tried a bunch of amino acids: Neuro drinks, Alpha Brain pills, and L-Theanine, which are amateur GNC “nootropics” commonly found in gas station energy drinks. 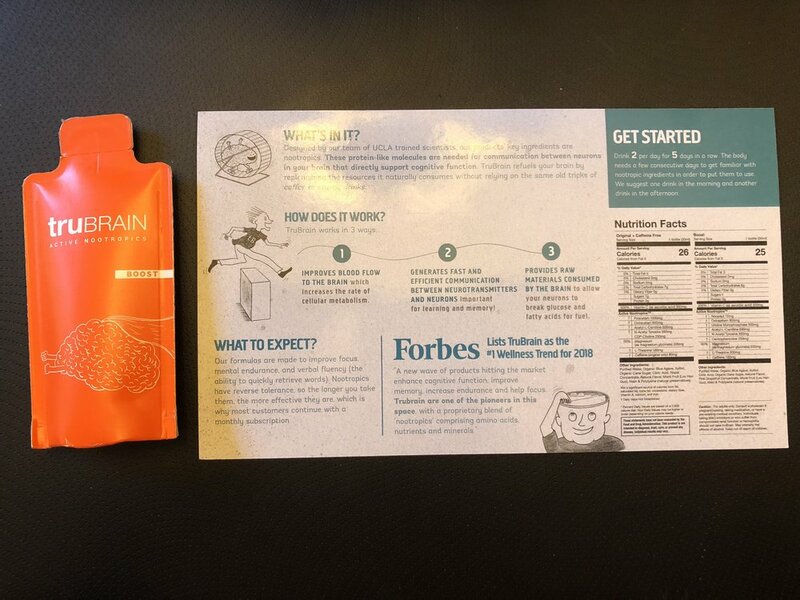 According to the people who are actively part of the nootropics culture, products like noopept and truBrain Boost (the orange packet that contains noopept) are the choice nootropics for startups, executives, and CEOs. They might supplement with amino acids (truBrain contains amino acids) but it’s not the active cognitive enhancer they rely on. I suggest Ross and Carrie revisit this topic. The FDA does not approve nootropics (yet), so we have no idea what the long-term effects are. This means they could go either way: they could become something our children or grandchildren take on a regular basis, much like a multivitamin. Or, research could come out linking nootropics to neurological disorders and any of the early adopters, including myself, could be at risk for some new disease. I’m not trying to scare anyone or be too hopeful, but this is the reality for early adopters. We just don’t know. This is a comprehensive overview of noopept. Link to the truBrain overview. +13. They’re supplements… that turn into drugs… what? What is the difference between drugs and supplements? Drugs are tested and regulated by the FDA and supplements are not. Nootropics are supplements (because the FDA doesn’t regulate them), but some nootropics, like Adrafinil (as I previously mentioned) turn into Modafinil when it’s metabolized, which is a drug prescribed to people with narcolepsy. I'm fairly straight edge (drugs are bad, m'kay), and taking drugs like amphetamines and nicotine (as previously mentioned) often turns into an addiction. I think if nootropics do tip and there is widespread adoption, the wording is going to be important. Supplements sound safer than drugs even though they're potentially more harmful (because there are more unknowns and we don't know what we don't know). That's why I like truBrain; even though it is a supplement they appear to be transparent with what they do know. I’m still skeptical if I really am more productive or just feel more productive. I am curious enough to extend my trial and continue tracking my productivity. So far, comparing my normal output to the last two weeks, I have noticed an increase in productivity—I want to make sure it is sustainable. Some users on web forums have said the benefits dissipate after two weeks, which would suggest tolerance or the placebo effect. I signed up for a 30-day trial from truBrain for a few reasons. First, they have the dosing right. Second, I like the taste: Blue agave, monk fruit, and it goes down smooth. Third, the marketing works :-) Their story has been picked up by CNBS, Inc., Forbes, TechCrunch, CBS, and Bloomberg. Also, even though I know most of the food I eat has been engineered by people with PhDs, knowing that “UCLA-trained neuroscientists" are behind truBrain makes me feel good. It doesn't make logical sense, but it makes emotional sense. Good job, marketing team. Proceed with your scientist’s cap on. If you do try noopept, try micro-dosing. Keep in mind, these are not regulated, and we really don’t know the long-term effects. Understand that there are risks to being an early adopter. I think truBrain is healthier than the high-fructose corn syrup 50g of sugar, high caffeine, “herbal” supplement energy drink that’s for sale for $2.99 at the gas station. If you think truBrain is right for your lifestyle or if you simply want to try it out for a few weeks, use this link for 20% off (it's a referral link so I get my next box at a reduced price). If you want to buy noopept directly, you can purchase it here (this is not a product link--I'm not making money if you buy from here). Oh, all of this was written on nootropics :-) And so was last week’s post. If you have noticed any differences in my writing, let me know. As always, feel free to comment and/or send me an email. * Limitless was based on the book The Dark Fields by Alan Glynn. If you liked the movie or if you like fun sci-fi techno-thrillers, support the author and check out his book.